Being pregnant while traveling can be stressful, but it doesn’t have to be. Doing a little extra prep beforehand can go a long way to reducing discomforts en route at and at your destination. Here are nine things you can do to help make travel during pregnancy a little easier. Because medical emergencies for pregnant women are more likely to happen during the first and third trimesters, the best time to travel is during the second trimester between 14 and 28 weeks, according to the American Congress of Obstetricians and Gynecologists. That’s also the Goldilocks period of pregnancy, when morning sickness has likely subsided, but you aren’t yet at the stage where you’re so big it’s hard to move around. ACOG says occasional travel up to 36 weeks is generally considered safe for women who are at low-risk for medical emergencies, but airlines have their own cutoffs and documentation requirements. Speak with your healthcare provider about any concerns before planning your trip, and check with the airline prior to booking flights to see their policies for pregnant travelers. 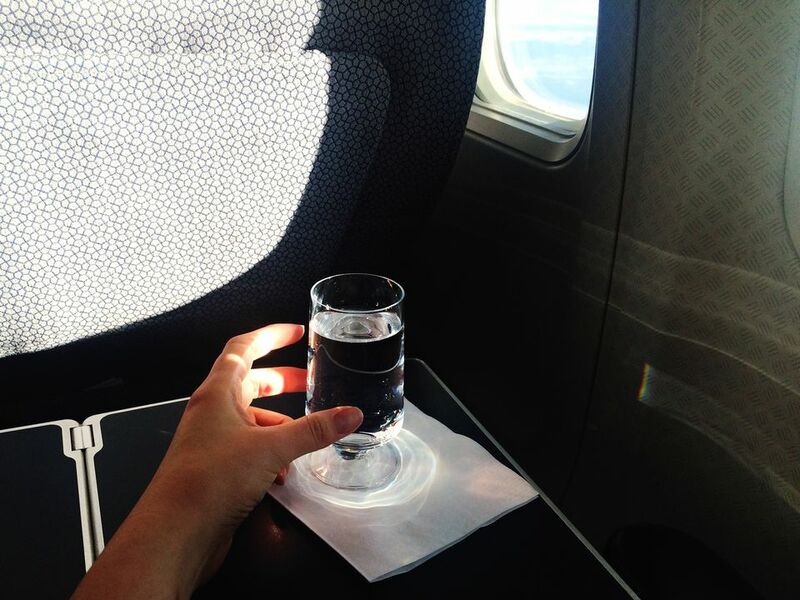 Airplane cabins typically have low humidity levels, making it easier to get dehydrated during longer flights. For most travelers the effects are negligible, but for pregnant women, getting dehydrated can exacerbate symptoms like nausea, fatigue, cramping, and constipation—not to mention increase risks of complications like preterm labor. Make sure you always have water with you, and take small sips every few minutes even when you’re not thirsty. Similarly, an empty stomach can make issues like morning sickness worse, and drops in blood sugar can lead to feeling faint. Be sure to have healthy snacks or ginger candy on hand and within easy reach to keep nausea at bay and blood sugar levels relatively stable. One unfortunate side effect of both pregnancy and adequate hydration is needing to go to the bathroom frequently. You don’t want to be caught staring angrily at that “fasten seatbelt” light on a turbulent flight while your bladder is being jumped on like a trampoline. Take advantage of restrooms when they are accessible, even if you don’t think you need to go. Before leaving a restaurant, the airport, museum, etc., make a point to swing by the facilities just in case. Your bladder will thank you. Not only will you almost certainly need to get up to go to the restroom during flights, but you’ll also want to get up and stretch your legs. Snagging an aisle seat can give you a little more freedom to get up and move around if you need to—not to mention, a more harmonious experience with fellow passengers in the seats next to you. They aren’t always the sexiest fashion accessory, but compression socks are a pregnant woman’s best friend. Your circulation changes during pregnancy, and that can lead to things like swelling and headaches. Compression socks or “support hose” can help keep the blood flowing as well as help reduce other pregnancy-related discomforts like restless leg syndrome. While light to moderate exercise is encouraged during pregnancy, heavy weight lifting is not. Avoid packing overstuffed bags that need to be hoisted up into overhead bins or onto airport scales. Packing according to a color palette so that clothes can be mixed and matched, easily reworn, and paired with the same shoes and accessories is a good way to cut down on the amount of stuff needed to take with you. As is using multi-functional items like a soft jacket that can double as a blanket or pillow. Depending on where you travel, many items—like shampoo or toothpaste—can also be purchased or found at your destination, allowing you to leave those non-essentials behind. Speak with your healthcare provider about how much weight is appropriate for you to lift at your stage during pregnancy, and err on the side of too little rather than too much in your bag to avoid potential complications. Setting aside the many physical changes that your body goes through when you’re growing a person, pregnancy can also be stressful and cause insomnia for some women, leading to exhaustion. You probably won’t be able to do as much as you could pre-pregnancy, and that’s OK.
Budget time during your trip to let yourself rest. Book layovers so that you can easily get to your next flight without running through the airport. If you’re going to drive, try to limit yourself to no more than five or six hours in the car per day with a lot of stops to stretch your legs. Incorporate breaks (or even better, naps!) into your daily itineraries to make sure you have opportunities to recharge. And be sure to pace yourself. You don’t want to do so much so early in your trip that you don’t enjoy the latter part of it. While travel is safe for the vast majority of pregnant women, things can happen. Plan ahead by knowing what your emergency medical options are en route and at your destination—especially if you are traveling overseas. Keep a copy of your prenatal documents on hand. And speak with your doctor about warning signs or things to look out for. Knowing you have a contingency plan in place can give you peace of mind while away from home. Don’t be afraid to ask for help when you could use it. Traveling can be stressful, and pregnancy adds on layers of complications and potential risks. Forgot your snack and now feeling faint? Ring the flight attendant to ask for a glass of juice. Not sure you should lift your bag? Enlist someone nearby to assist you. Feeling overheated and need a seat on the subway? Don’t hesitate to ask someone to give up their seat. Even if you don’t yet look pregnant, if you explain the situation, people are almost always happy to help.